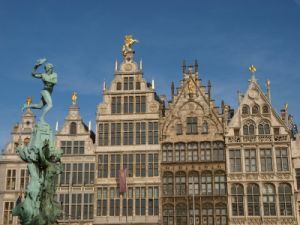 The world's diamond capital and home of Flemish Baroque painter Peter Paul Rubens, Antwerp, Belgium, is a joy to visit. The wide squares and the narrow cobbled streets of the old town are perfect for strolling—they're lined with shops and cafes, which make the walk even more pleasant—and there's a thriving nightlife. Antwerp is 34 mi/55 km north of Brussels.